Jacket illustration: Araucaria araucana stand and snow capped Volcan Llaima, Conguillio National Park, Chile (photograph by Bruce Burns). WHILE pines, spruces, firs, and other conifers prominent in northern hemisphere landscapes, particularly in mountain and high-altitude environments, have been the subject of much scientific study, southern conifers have been largely overlooked, even though almost one-third of all conifers-some 200 species-are found in the southern hemisphere and many more occur in the tropical lowland forests that straddle the equator. Some researchers have even characterized the southern conifers as relicts or living fossils, destined to be swept away by a rising tide of flowering plants. Ecology of the Southern Conifers brings together, for the first time, information on this diverse and unique group of plants. Twenty-eight scholars from around the world examine the history and ecology of the southern conifers, and emphasize their importance in understanding the evolution and ecological dynamics of southern vegetation. Drawing together the results of research from ecosystems as varied as the South African fynbos and New Caledonian rainforests, the Argentine steppe and inland Australia, this book searches for unifying themes and seeks to relate these to modem evolutionary and ecological theory. Ecology of the Southern Conifers demonstrates the plants' significance for understanding evolutionary and ecological processes in the southern hemisphere. ASSOCIATE PROFESSOR NEAL J. ENRIGHT is Reader in Geography at the University of Melbourne, and has worked and taught in Canada and New Zealand. He is a member of the ecological societies of Australia and New Zealand, the Royal Society of New Zealand, and on the editorial advisory boards of the Journal of Biogeography and Global Ecology and Biogeography Letters. PROFESSOR ROBERT S. HILL is Head of the Department of Plant Science at the University of Tasmania. A fellow of the Linnean Society of London, he is also a member of the International Organisation of Palaeobotanists and the International Commission for Palynology. He is the founding editor of Southern Connection's newsletter, and on the editorial advisory board of the Australian Journal of Botany. THE CONIFERS of the southern hemisphere have long fascinated ecologists and natural historians. They are among the largest and most visually striking trees in the hemisphere. Their often emergent habit and unusual canopy architecture greatly enhances the aesthetic appeal of the landscapes in which they occur. The decline of the conifers and rise of angiosperms since the early Cretaceous is one of the most fundamental changes which has occurred during the history of the Earth. Many of the southern species have broad leaves, and none has the needle leaves of the northern hemisphere pines (Pinaceae) which are now so common as plantation trees in our hemisphere and typify what many lay people believe a conifer to be. The southern conifers seldom occur in extensive and dense stands like their counterparts in the boreal and mountain forests of the northern hemisphere. Most are geographically restricted, and yet many are also highly valued for their timber and other products (e.g. resins). Exploitation from the earliest days of European settlement of the southern lands, coupled with habitat conversion due to land clearance for agriculture and through the increased frequency of fire, has further reduced the abundance of many species. This book reviews the ecology of these southern conifers. 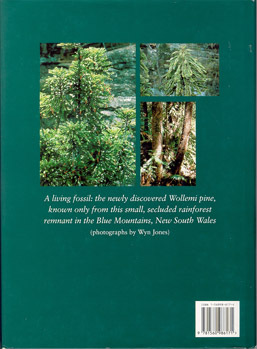 The idea for this book took shape in discussions following a workshop meeting on Comparisons of Southern Hemisphere Ecosystems organised by Peter Raven, Ebbe Nielsen and the Missouri Botanical Garden, held at the Bishop Museum in Honolulu, Hawaii, on 25 May 1991. 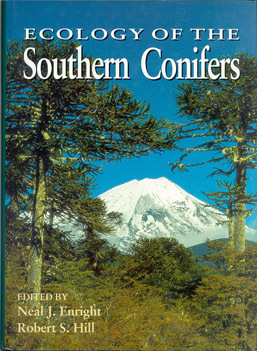 A symposium on the southern conifers was included as part of the Southern Connection Conference organised by Bob Hill and held at the University of Tasmania in Hobart, 27-31 January 1993. However, this book is not a symposium proceedings. It is structured to provide as complete an analysis of the present state of knowledge concerning the ecology of the southern hemisphere conifers as is possible. The meeting gave us the opportunity to get many of the chapter authors together, and to float some of our ideas in front of a well-informed audience. Field visits introduced our colleagues from South America, South Africa and New Caledonia to the conifers of Tasmania, affording them a broader context -within which to place their own experiences. Glenn Stewart and Neat Enright subsequently visited conifer stands in Chile and Argentina and benefited greatly from the field knowledge of Juan Armesto and Thomas Veblen. Some new links across the southern hemisphere have been forged as a result of these meetings and the preparation of this book. We hope that new research projects may be initiated which further advance our understanding of the ecology and dynamics of the southern conifers.